Mathematics is the language we use to understand and communicate our knowledge about electrical relationships. It is easy to get overwhelmed by some of the complexity involved. The best approach is to begin at the most fundamental level and take it from there. These are the most fundamental equations that characterize a sinusoidal signal. In this context, two questions arise. First, one might wonder what π — an irrational number relating the circumference of a circle to its diameter and the area of a circle to the square of its radius — has to do with the way in which a waveform represents an oscillating electrical or electromagnetic signal. Second, why is there a term for frequency in an equation that represents the amplitude of a waveform as it varies over time? Concerning the ubiquity of π, an easy way to visualize the relation of the sine wave to a circle is to construct a right triangle on the grid created by an X-Y axis in the two-dimensional space as depicted on an oscilloscope display. The X axis is defined as representing various points in time (for example seconds) and the Y-axis is defined as the concomitant variation in amplitude (for example volts). As the amplitude of the oscillating sinusoidal signal changes with respect to time, the points representing instantaneous time and amplitude slide along the respective X and Y axes. That is because as time passes, the amplitude of the sinusoidal signal changes. The remarkable thing, however, is that the ratio of the quantities as graphed or shown in an oscilloscope is not constant. Specifically, as the point along the Y-axis gets farther from 0, the rate of change of the point along the X-axis drops. Looking at the time-domain graph of a sine wave, the higher the amplitude in volts, the lower the rate of change in that amplitude; the lower the amplitude in volts, the higher the rate of change in that amplitude. The ratio of these quantities changes, but because the flow of time is constant, all this rate change shows up in amplitude. That is the essence of the sine wave. As angular velocity changes, the point where the horizontal and vertical lines intersect will be seen to move within the confines of the graph or display so as to form a perfect circle. The sinusoidal relationship of amplitude and rate-of-change of amplitude, when shown in a polar graph, is displayed as a circle. If we draw a straight line between the X-Y intersection, known as the origin, to the moving point, its length will be constant, the endpoint forming a perfect circle, and this is the rationale for the presence of π. A sine wave can be represented in terms of the Y amplitude of the rotating unit vector. Similarly, the cosine can be represented as the vector’s X amplitude. Moreover, this line forms the hypotenuse of the right triangle that has been placed on the X-Y grid. In trigonometry, the ratio of the side that is opposite to the angle formed by the moving line, known as the vector, and the hypotenuse, is constant for all right triangles. This value is the sine, and it can be found by consulting a book of trigonometric values, also available on the internet. That brings us to the question of why a frequency term is in the waveform generated by plotting amplitude against time. The electromagnetic spectrum is made up of radiation at various frequencies. It is sometimes more useful to think in terms of wavelength rather than in terms of its reciprocal, frequency. The shortest wavelength or radiation that can realistically be described is equal to the Planck length, a single discrete grain of quantum space. It is unimaginably small, about 1.6 × 10-20 times the diameter of a proton! Equally mind-boggling, at the other end of the spectrum, is the largest wavelength: It spans the diameter of the observable universe. Frequency has an inverse relation to wavelength, and power contained in any given burst of energy varies enormously when frequency and wavelength change. It takes more power to cause audio, electrical or electromagnetic waves to oscillate at a higher rate. The most energetic electromagnetic radiation, gamma rays, have no lower limit to their wavelength other than as imposed by the Planck length, hence they can have unimaginably high frequency and power content. The sine wave is the most basic of the infinite variety of waveforms. Any waveform that is not a pure sinusoid will have a portion of its power at frequencies other than the fundamental. Joseph Fourier (1768-1830) analyzed this behavior in the context of heat propagation. His Fourier Transform denotes both the mathematical process and the end result when a non-sinusoidal signal is translated from the time domain to the frequency domain. In this operation, a complex waveform is resolved into and displayed, perhaps in the form of a bar graph, as the amplitude in power of sine waves at discrete frequencies. The assertion is that any non-sinusoidal waveform, regardless of its complexity, can be decomposed into constituent sine waves. This process is reversible and it can be recomputed any number of times with no loss of information. The Fourier Transform involves complex computations. In the 1960s a much easier way to accomplish the Fourier Transform was developed and dubbed the Fast Fourier Transform (FFT). It uses matrix theory together with simple algorithms to bypass all that difficult math. 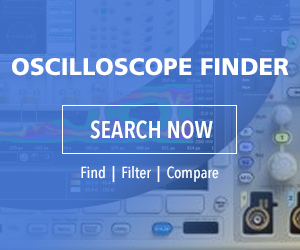 FFT is incorporated in one type of spectrum analyzer and in virtually all modern digital oscilloscopes, permitting users to press a button to view a complex non-sinusoidal time-domain signal as the sum of discrete sine waves at various frequencies other than the fundamental.